Here is the perfect introductory guide to the history and ideas of the Quakers, one of the world's most fascinating and enigmatic religious groups. Emerging in England in the 1650s as a radical sect challenging the status quo, the Quakers are now best known for their anti-slavery activities, their principled stance against war, and their pioneering work in penal reform. Famous Quakers include Thomas Paine, Walt Whitman, Lucretia Mott, Herbert Hoover, James Dean, Judi Dench, and A.S. Byatt. And while the group still maintains a distinctive worship method to achieve a direct encounter with God, which has been at the heart of the movement since its beginning, Quakers today are highly diverse: some practice a protestant evangelicalism, others are no longer Christian. In this generously illustrated book, Pink Dandelion, the leading expert on Quaker Studies, draws on the latest scholarship to chart the history of the sect and its present-day diversity around the world, exploring its unique approach to worship, belief, theology and language, and ecumenism. 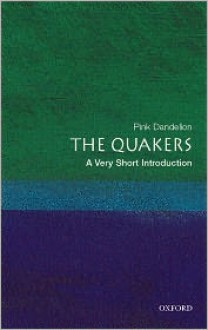 It concludes by placing the Quakers in the wider religious picture and predicting its future. A very academic look at Friends.